Saturday Night Live closed its season by signaling the possible end of the reign of Donald Trump. Saturday Night Live capped off it’s highest-rated, and likely most important season in two decades this weekend with a decidedly apolitical show hosted by Dwayne “The Rock” Johnson. But the show’s cold open eerily mirrored one of the SNL’s most poignant moments of the season. The weekend following the election, on November 8, Kate McKinnon stepped out onto the stage as Hillary Clinton and sang a deadly serious version of Leonard Cohen’s “Hallelujah.” Adding to the emotion of a Hillary stand-in singing the dirge was the fact that the beloved singer/songwriter Cohen died that week. For this week’s cold open, SNL flipped the script on “Hallelujah” turning it into a sad parody for what has felt like the end of Donald Trump’s ill-begotten presidency these past few weeks. Stepping into the tangerine cotton candy wig he’s worn since last fall to portray the man who sits in the Oval Office, Alec Baldwin began the number solo at the piano. Soon, Kate McKinnon’s Kellyanne Conway, another searing impression of the season, joined him. Quickly, those who gained from hitching their wagon to Trump and those who stand to lose from any imminent Trump downfall, began to filter onto the stage and sing, including Beck Bennett as Mike Pence, Mikey Day and Alex Moffat as the Trump sons Donald Jr. and Eric, Aidy Bryant as Sarah Huckabee Sanders and the grim reaper as Steve Bannon. Finally, Cecily Strong strolled in as Melania Trump, with a surprise appearance by Scarlett Johansson as the “Complicit” Ivanka Trump at her side. 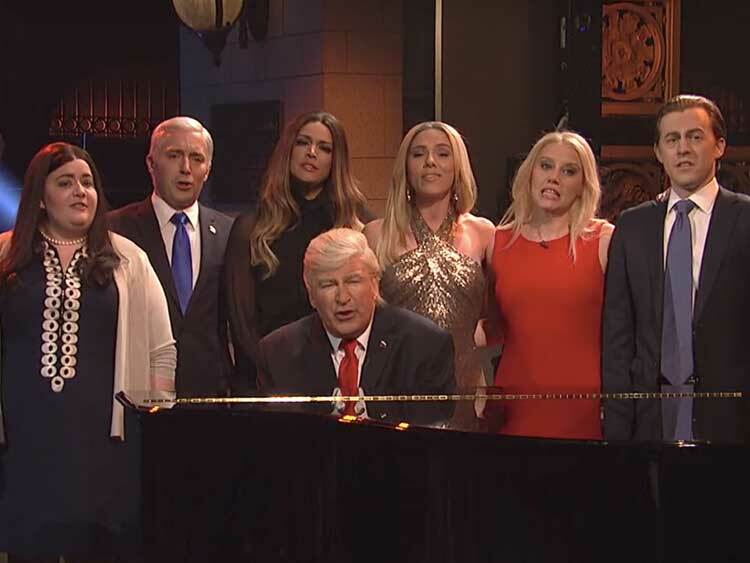 It was fun to recall the actors who’ve delivered fantastic impressions throughout SNL’s renaissance season, but the image of Trump flanked by his sycophants also illustrated how easily the dominoes could fall. Before the compulsory delivery of “live from New York, it’s Saturday night,” Baldwin’s Trump paused to say something stereotypical of the man whose presidency is on the precipice since he fired FBI Director James Comey and all that’s been revealed since. “I’m not giving up because I didn’t do anything wrong, but I can’t speak for these people,” Baldwin’s Trump said, throwing his enablers under the bus.